We are a community of caring individuals brought together by a common bond – love! Our congregation is composed of people from all walks of life who come together to offer healing and comfort, learning and encouragement - much like a family. We welcome all, and believe that extravagant hospitality is central to the role of our church. At Beaver UCC, we strive to help our members grow spiritually, while at the same time understanding that everyone has their own spiritual path. Our church is a place where you can think for yourself while differing views are respected. It is our hope that through education, fellowship, and service we can, as a community, come closer to God and each other. 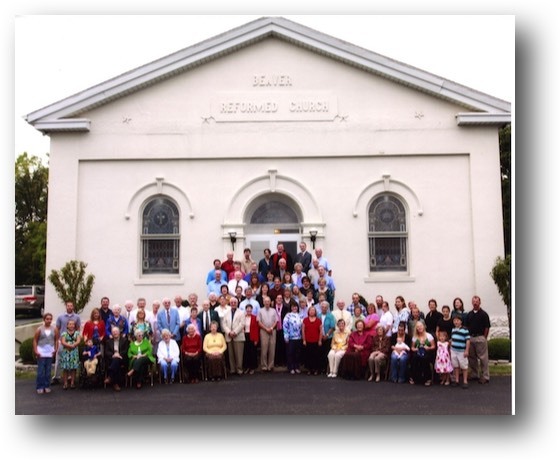 Since our founding over 200 years ago, Beaver Church continues seeking to offer an atmosphere of informality, spontaneity, fellowship, and fun. We hope our Church is a place where you and all will feel both welcome and comfortable. Meets: Upstairs each Sunday after the children’s moment, year round. This class is for our youngest students and there will be a combination of play and some instruction depending on the ages present. Meets: Upstairs each Sunday after the children’s moment, September through May, with a one month break around Christmas. This class is for our younger learners and will be focused on instruction and lessons. Material will be taught from a children’s story type Bible. Children less comfortable with working on lessons might wish to stay in the nursery, and those that are more advanced might wish to go to the older class. This class will be a Bible and faith study where children will read scripture lessons from the Bible each week and study them. Children will also learn about Christian faith themes present in the topics and readings for the week. Readings should somewhat overlap with the readings given in the service. As children reach the point where the curriculum or discussions seem less challenging, then they are encouraged to stay in service, attend the Adult Bible Study, and seek confirmation with the Pastor when ready. During breaks, children will be asked to stay in service. Meets: In the fellowship hall each Sunday at 9:30 AM, September through May. This class will be a Bible and faith study each week led by Pastor Brian. Jr. High and Sr. High youth and Adults are encouraged to attend. Do you know someone who would appreciate our prayers, receiving a card from us, or having Pastor Brian visit with them? Please let us know. 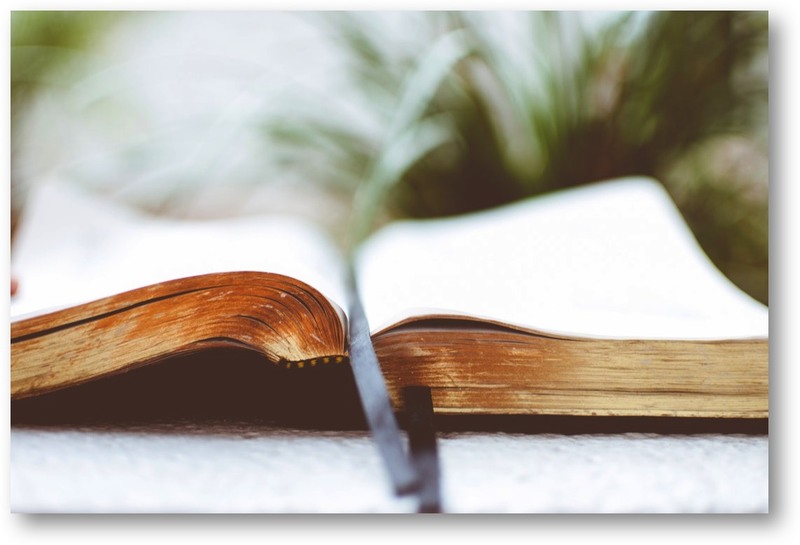 The Prayer List and Card Ministry will never be published on our website, although it will be included in our monthly newsletter. Beaver UCC offers wedding services including space rental, pre-marital counseling, and officiating for both members and non-members. Please contact the pastor for more information. Our church offers support in any way we can to assist those who are grieving the passing of a loved one. Funerals are generally held in the sanctuary and a meal is provided by the church afterwards. Confirmation classes are held each year for teenagers who wish to join the church and know more about their faith. Classes generally start in September and culminate with confirmation in May. The church offers pastoral counseling for members and non-members. Please see the Pastor’s Page for information on office hours. Beaver Church is wheelchair accessible with elevators. Sound reinforcement devices are available for the hard of hearing as are signers for the deaf. Please let us know if you have any special needs. Music is an important component of worship at Beaver Church, one that lifts our spirits and helps us rejoice in God and with each other. Everyone is invited to participate in Beaver UCC’s choir - all you need is an appreciation of music and a desire to learn. We also encourage any and all musicians who wish to share their talents with us during worship. If you would like to join the Beaver Church Choir or provide accompanying instrumental support during a service, please contact our choir director or Pastor Brian. Beaver UCC’s Adult Choir provides music for each worship service from September through May, plus a special service on Christmas Eve. Practices are held following Sunday Worship in the church sanctuary. Service is just as important to Beaver Church as fellowship. Weekly contributions of food and clothing are taken to local food pantries and service organizations for those in need. Volunteers plan special activities for residents of nursing homes, while the congregation as a whole makes Christmas brighter for folks by sponsoring food and gift drives each holiday season. Members of our congregation also support a variety of other charitable causes with time, money, and in-kind donations, including Heifer International, the Dayton Food Bank, the Salvation Army, and the Connor Puckett Fund. 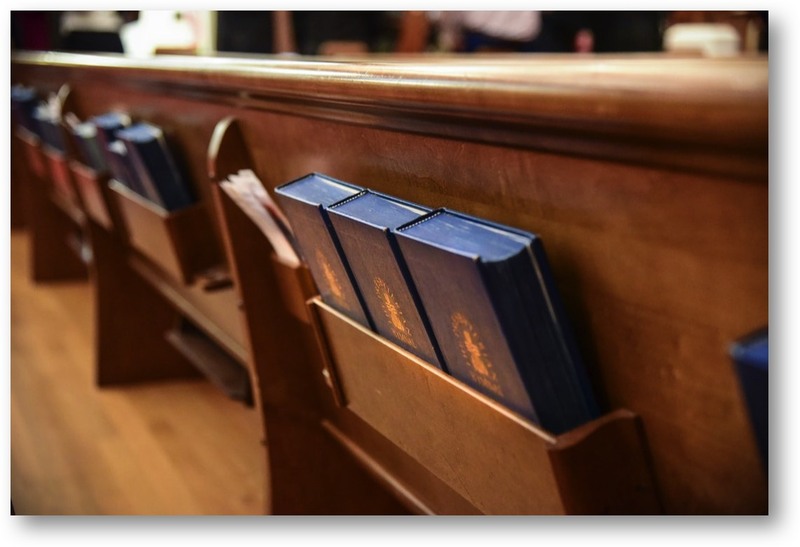 The religious heritage of the United Church of Christ (UCC) stems from the great traditions of the Protestant Reformation - Lutheran, Calvinist, and Congregational. These traditions were brought to America by Protestants fleeing persecution in Europe. Four religious traditions, including the German Reformed, of which Beaver UCC was part, united in 1957 to become the United Church of Christ. Today, any local church or denomination is welcome to apply for membership in the UCC. Beaver Church's services feature a combination of formal and informal worship. Our service includes communion on the first Sunday of the month, and all are welcome to participate. Beaver Church offers monthly activities for our congregants, including special youth events for our younger members. 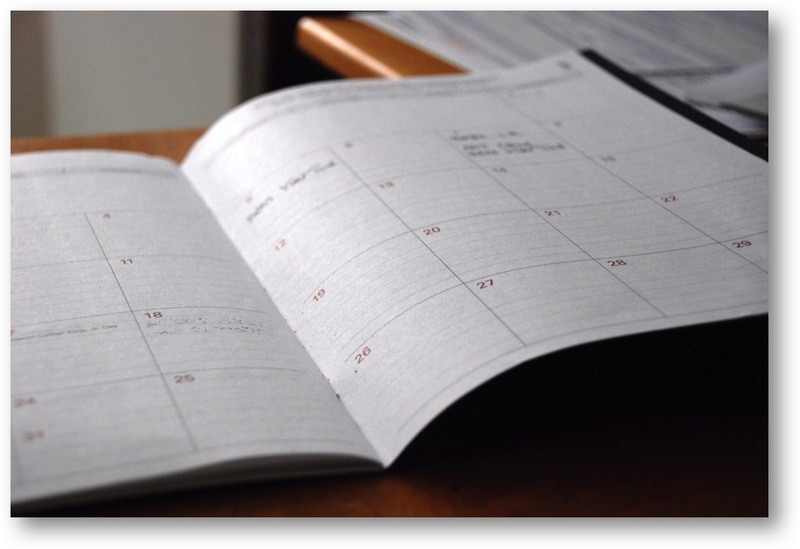 Monthly activities, events, and news are listed on both our website and monthly Beaver Church Chatter newsletter. When available, Pastor Brian's sermons are posted on our website by Thursday each week. Sermons are available on The Pastor's Page™. We will be continuing communion every Sunday in Lent as a way to help mark the significance of the season. We will therefore have communion on each Sunday starting March 3rd through Easter, April 21st. Please join us on Saturday April 6th at 10:00am. We will spend some time cleaning up the outside of the church, weeding, and cleaning the shelter etc. We will also be spreading some new mulch in the planter beds. Please bring gloves, rakes, wheelbarrows, sprayers for weeds, or anything else helpful if you have them. 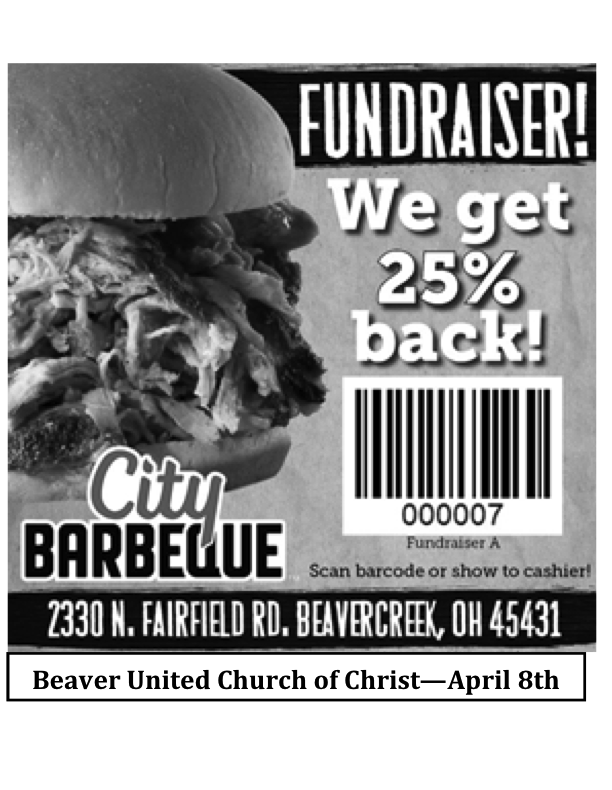 Take a break and come join us at the Beavercreek City Barbeque on April 8th at 6:00pm for some awesome food and fellowship while raising money for the church. If you cannot make it at 6:00 pm, that is fine; you can come anytime of the day and even take it “to go” if you like. Bring family, friends and most importantly the (printable coupon at bottom of page) so the church can get back 25% of your purchase price. See you there!!! Ladies night will be Friday April 12th at 6:00pm. Stay tuned for more details. Lilies are a symbol of the resurrection for the Christian Church. Help us beautify our sanctuary on Easter Sunday. Each plant is $12.00, and you may take your lily home at the end of Easter Sunday Worship. Click here for the lily order form. On Thursday April 18th at 6PM we will have a Maundy Thursday service in the lower level of the church. There will be a light meal along with the service, soup will be provided and people are encouraged to bring other simple food for the meal. Maundy Thursday commemorates the Last Supper and marks the last moments before Christ went to the cross. It is a solemn but meaningful service. Please join us as we journey with Christ and each other. We need some volunteers to help with Easter Breakfast, so please look for a signup sheet under the clock in the sanctuary. The Easter Breakfast will begin at 8:45 am on April 21st, Easter Sunday, and food will be served for about an hour. This year’s menu will include pancakes, eggs, sausage, juice and coffee. There is no set charge, but donations are welcome. We will be having an Easter egg hunt on April 21st after the 10:30 Easter service. The event will be held outside if the weather permits and inside if there is bad weather. Please feel free to bring plastic eggs with treats in them in the weeks leading up to Easter. They can be left on the island in the kitchen. Mark your calendars; we will have a youth event on Friday April 26th starting at 6:00pm. Activities are to be determined and suggestions to Pastor Brian are welcome. Once again, on Sunday April 28th, we will have a special Sunday where the congregation gets to ask the pastor questions. Instead of a regular sermon, Pastor Brian will randomly pick several questions out of a basket to answer. Perhaps there is a theological question that you are just burning to have answered—or any other query of interest. We will have pieces of paper and pens out in advance for you to list your questions. Mark your Calendar for the BUCC Annual Garage/Basement Sale!! Our basement sale has been scheduled for May 2nd, May 3rd and May 4th. To make this event successful and stress-free teamwork is absolutely necessary!! #1 - We need donations! Please save those forgotten goodies for us. Please try to store items until after April 1st. If you absolutely need a place to store items prior to April, contact Pastor Brian and we will figure something out. #2 - We need help on April 28th, after church. That is when we will ask all congregational members to help set up tables and put all the items out for pricing. #3 - We need people to sign up to staff the garage sale. In April you will find a signup sheet in the back of the church. #4 - Lastly, we need church members to help us pack up leftover items to go to the Salvation Army. We will do this after church on May 5th. Thank you and hope to see you and your forgotten treasures at the garage/ basement sale. City BBQ Coupon – Click printer icon, bottom left corner, to print.